No!! I don’t want a bath. Even a facecloth and soapy water. Aw, Let me go. I’m all wet and I’m cold. Now, you’re trying to smother me with a towel…..poor me. Thank goodness I thought I’d never be free of that awful stuff and the mom handling. I was left wet and cold…..what a day. I’m having a hard time smiling for my selfie, There I got it. 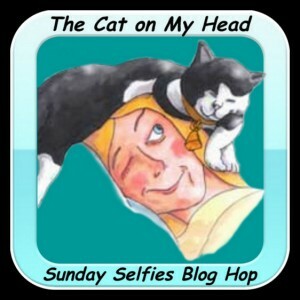 Please, go see your buddies doing their selfies at The Cat On My Head blog hop. Have a fun Sunday, my friends. 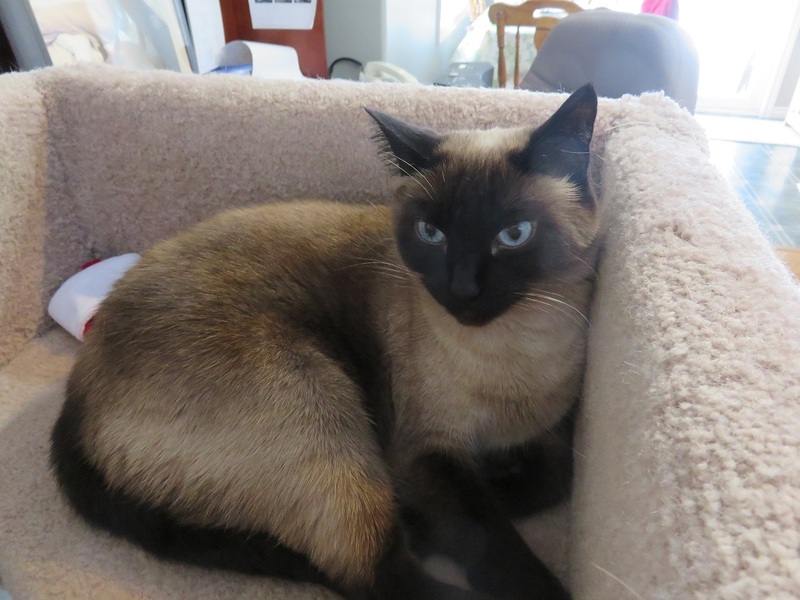 This entry was posted in Uncategorized and tagged bath, friends, smiling on January 20, 2018 by The Canadian Cats. Cold?? Why have you been up to? SNOW? Get warm and have a great Sunday!! Shoko is exaggerating…yes she got the facecloth treatment but wasn’t dunked in water. She got the same as i did and I purred al through my treatment. Stay warm, Shoko. Hope you gave a great Sunday! Thanks my friend. We’ll be warm. Poor Shoko – had to be tortured before the selfie? Not fair! She is just complaining cause she liked the stink and mom didn’t. I was dry in 15 minutes. Geesh! What a whimp. Oh the indignity of it all, Shoko. Maybe now you will get some extra treats? On the plus side, you look gorgeous and dazzling. Just right for your Sunday Selfie fans! Really! You think I got extra treats? No way? Kali just gave me a bad time cause I love water….when its my idea to be in it but not when mom decides I should be in it. Geesh! That’s a mighty fine selfie! Baths aren’t fun are they. They are necessary, but not fun. The only furry critter that deserves to be wet is a raccoon that falls in the swimming pool… Otherwise…huh-uh!!! Oh, you got the “facecloth bath.” I can empathize. Mom comes at me all the time with “kleenex” and sometimes it is moistened with her spit. Ick! She’s always trying to clean my eyes! I’m hope you found a heater to warm your furrs. Hugs! Really, she could just leave me be and let me stink….I thought I had a unique aroma. Mom thought I did too but she didn’t like the uniqueness. Thank you Zorro and Pixie. I tried but it was hard to smile after being wet. Dear Shokolino, why your mom washed you. Do you were dirty I think cats need only brushing and shining. 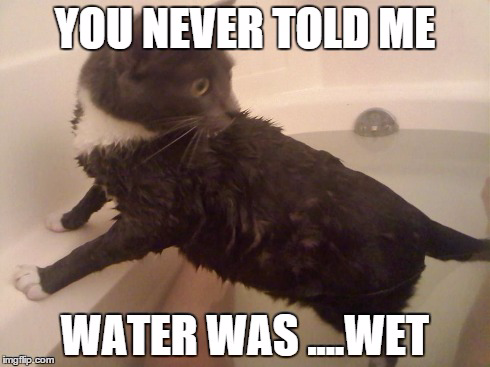 I am sure you agree, getting wet is baaaad. I know why she did it. She didn’t like the perfume I found outside and rolled in it. She is a picky one. I thought I smelled pretty. Kali enjoyed it but I was not amused. Mom says sometimes we need a bit of help to stay clean. Yes, when mom gets my perfume off….but I liked it. I was unique! Mee-you mee has rolled inn due-beeuss fingss befur when mee walked LadyMum last eyar. Shee wood put us inn bathroom an then fill sink with warm water an then face cloth wash mee…..An rinse & ree-pete! An then blow dry mee!!! What a weerd feelin……thee moral of thee story iss mee stopped rollin inn stuff 😉 Hu’Manss sure are funny aren’t they Cuss-inn Shoko?? Heavens!! You were blow-dried? I don’t think mom has a blow dryer or she would have used it. You understand where I’m comin’ from, cuss. Peeps…I don’t understand them. She didn’t like the smell of the perfume I put on when I was eating grass beside the house. I thought I smelled fantabulous. Yes, I am but don’t tell anyone. You are too bold getting your face washed…..are you that messy? Yes. I. Am. It’s the raw diet. Especially the eggs. But it’s worth it! Why did you need a bath, Shoko? Can’t you wash yourself? That’s what we do. Ahh…you weren’t wearing my new perfume that I found on the bare strip beside the house. Mom didn’t like it. I thought it was cool. OMC, I are glad ya survived! I wash myself Binky but not when I smell as wonderful as I did after rolling in some perfume. Mom disliked my perfume. MOL…you made me laugh and I love ya for it. This topic was not amusing to me…a bath..ughhh yet you brought some cheer into the picture. I have never been farted on even by Kali….she’d be horrified to have anyone think she ever farted but she does. As she says “passes air bubbles”..ya right, Some air bubbles. You look very nice in your selfie! You two are some great looking gals.